START: DUNOON PIER CARPARK FROM 9AM SATURDAY 23RD JUNE. On the A815 north from Dunoon look for the entrance to Glenbranter village which is well sign posted, drive into Glenbranter village and look for the green arrows directing you into the car park, please drive slowly and considerately in the village. Once parked follow the green arrows to the designated spectator area, this is opposite the stage start and offers good views up the hill away from the start. Please do not wander out of this area and listen to the marshals at all times. Head south out of Dunoon on A815, a short distance out of town at the West Bay you pass a swing park on your left, take the next right into the car park across the road from the swing park, park up and follow the green arrows along Kilbride Road, you will be directed into the forest and the spectator area is about half a mile from the tarmac road, it will be arrowed all the way. The spectator area offers good viewing of a fast downhill section just after the start into a sweeping right hand bend before heading back uphill, the spectator area has been increased in size from last year and will have toilets and a food van. This spectator area is about 4 miles south of Dunoon, follow the A815 south until you come to Innellan, look out for the Osborne Hotel as you will be turning right up the hill just past the hotel, go up the hill and turn left at the top onto Wyndham Road, follow this road past the school to the forest entrance on the right, it will have green arrows all the way from junction with A815 and will also be arrowed to the spectator area. There is limited parking at the forest entrance, please do not block the entrance or park dangerously on the single track road. The spectator area is a fair trudge up the hill, if you make the effort you will be rewarded with a fabulous spectator area stretching along the banking on the top side of the road, there are no trees in this section so viewing of the stage is very good with a wonderful backdrop looking over the Clyde. 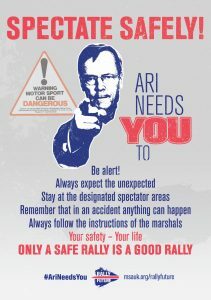 Please obey the Marshal’s directions at all times, they are there to make sure you are safe, do not attempt to stand in prohibited areas or move about when the stage is live as this will cause the stage to be delayed or cancelled. Forest Enterprise Scotland have carried out groundworks to make sure you can enjoy the Rally and the Forest safely, please leave the area as you found it and take your litter home. On behalf of Dunoon Presents, Mull Car Club and FES we hope everyone has an enjoyable day! The Spectator Control car will come through the stages about 20 minutes ahead of the competitors to keep you informed as to the progress of the rally. Be aware that if you, or others, are in an unsafe position, or continuing to ignore the marshals instructions, the Safety Officer has the authority to delay the stage, and in an extreme situation, request its cancellation. 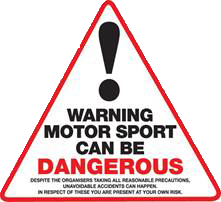 The MSA provide general guidance as to the unsafe areas where spectators should not position themselves.